Last week, one of the trending topics on Twitter was #CantDateYouIf. I never usually tweet on the trending topics, but I loved it so much I wanted to post the ones I tweeted. 1. #CantDateYouIf you don’t have your priorities straight: My priorities are family and work. If your priorities are going to a club/bar to party, it definitely would not work out. I hate clubs/bars more than anything. The only occasions you will see me there are for work, or if it’s a family or really, really close friend’s birthday (and I still try to get out of that one and suggest going to lunch instead). 2. 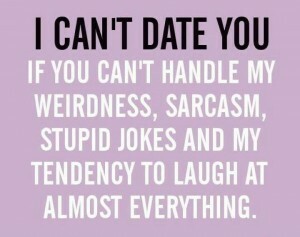 #CantDateYouIf you’re not funny: I am by far one of the weirdest people on the planet. If you can’t make me laugh, you’re boring, therefore you don’t stand a chance. 3. #CantDateYouIf you don’t believe in God: I wouldn’t be where I am, or who I am today if it weren’t for God, and I will never forget that. Proverbs 3:5-6. 4. #CantDateYouIf you don’t have goals: I make a new goal for myself everyday. Not exaggerating, just look at my iPhone notes. If you’re not goal-oriented, I’d probably end up making goals for you since I’m that obsessed with them. 5. #CantDateYouIf you smoke cigarettes: I hate the smell of cigarettes, and I especially hate it when people blow it in my face. Besides, smoking is bad for you – you shouldn’t do it anyway! 6. #CantDateYouIf you’re insecure: Two parts to this one. First, you need to be able to handle my career and not get jealous whenever I do an interview with some artist/athlete, or if I’m attending an event. It’s going to be my life, so if you’re easily jealous, don’t bother. Two, I am comfortable in my own skin and will literally go days and days without wearing make-up and walk around in sweats that are clearly way too big for me. If you constantly feel the need to impress people and change your look/values, that’s a big no-no. Definitely have more (such as the ones listed in the photo) but stopped at six because I did not want to blow up timelines. Anyway… people always say you should never have expectations for others so you’re not disappointed – and well, I disagree. High standards, high expectations. Check out more of my tweets here.